The Tides Marine Type-D rudder port is an integrated approach to rudder port installation. It is for boats constructed of FRP. It can be used for new boat construction and is also easy to use as a retrofit for replacing other types of conventional rudder ports. No tooling is required. 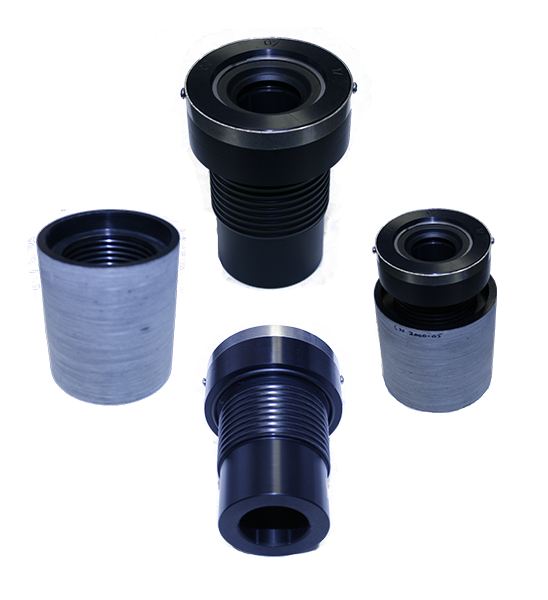 The Type-D is a sealed bearing consisting of a UHMW housing with a nitrile rubber lip seal. It eliminates metal-to-metal abrasion and electrolytic corrosion. The Type-D kit includes the bearing housing, which has a threaded OD, and a matching epoxy FRP "liner". The liner can be laminated into an opening in the hull. Once the liner is laminated into the boat structure, it provides a preformed cavity matching the bearing profile. The bearing can then be threaded in and out for easy removal or replacement. The Tides Marine Type D system components include a FRP liner and the Type D bearing and seal. Molded from FRP and compatible with polyester, vinylester and epoxy systems, each Type D liner has an internal thread to accept its corresponding rudder bearing and seal. The Type D rudder bearing and seal assembly consists of a one-piece UHMW housing with a nitrile lip seal. The UHMW bearing eliminates metal-to-metal contact and associated problems of abrasion and electrolytic corrosion. They are 100% watertight. Their performance characteristics match those of other Tides Marine rudder ports in that they are quiet, smooth and vibration free. The procedure for modifying the mold and installing the liner prior to lay-up differs according to the type of hull being produced. The following are three of the most common variations. Type 1: Molds with an existing "flat" at the rudder port location. This installation will use the standard flange-type liner. Type 2: Molds which require modification to achieve a "flat" surface or pocket for mounting a standard flange-type liner. Type 3: Molds which require modification to accept an angled liner to match dead rise and rocker angles. Rudder Port Bearings Type D may be ordered online.